Today we look at a long walk from a long time ago. It was probably 1979, and in the summer, a time when I was often with my grandparents in the Bronx. I had already acquired the lifelong fascination with streets and roads that I retain to this day, and my great aunt (my grandmother’s sister) planned a long walk for us in a neighborhood that alternatively could be called “South Riverdale” or Spuyten Duyvil. It on the western edge of the Bronx along the Hudson River and just north of the northern tip of Manhattan. This walk is quite a vivid memory. It is odd to realize that I can retrace most of it on a map. I know that we started out from what was then the intersection of West 230th Street and Riverdale Avenue, heading south up the hill to Johnson Avenue. The hillside was steep and wooded (as it is today), but then enough that you could see the flat city blocks towards Broadway to the east. We eventually turned right onto Kappock Street, which curved its way further up the hill amidst more buildings. From there, we turned north onto the service road for the Henry Hudson Parkway (NY 9A), which we followed for a distance. Though this mostly provided a view of the parkway itself, one could also look past it towards the Hudson River. 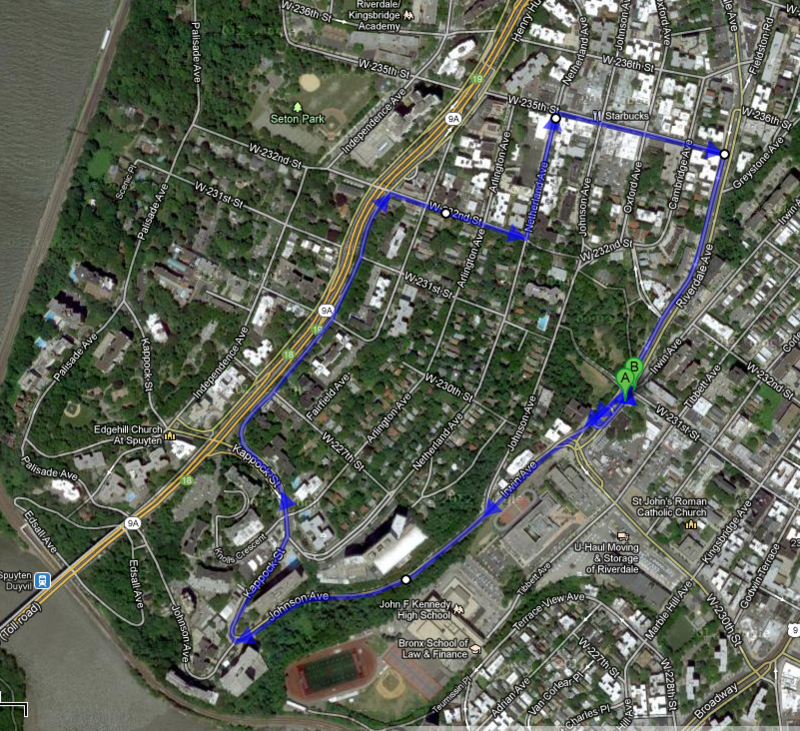 Ultimately, we turned away from the parkway onto West 235th Street, crossing Johnson Avenue again in the “downtown” section of Riverdale. The exact route we took to get there is a bit fuzzy, but I attempt my best guess in the map above. We stopped for a rest and refreshment (probably juice or milk as I hated soda), before continuing on West 235th towards Riverdale Avenue. It is on the side of steep hill with ledges separating lanes, so we walked along the higher section and descended the hill back to West 231st. In November of 2002, I wandered back along West 230th Street out of curiosity to see how things had or had not changed. An old library building I remembered was still there, as were most of the larger commercial buildings. But the area around the intersection at the end of 230th was completely reconfigured, with wide green spaces separating different directions. The nearby high school campus had gotten a lot bigger. One small street from the start of the original walk, Ewen Street, appeared to have been completely removed. It would like to re-create the original walk on a subsequent trip to New York, along with photos. It might even happen this year.